Formation: Three Dancers in a Line. Waltz time. Those who can Allemande Right 1/2. Those who can Allemande Left 1/2 (Also known as a Swing Through) (2+2). B2 Wide Hey - New Middle starts Right Shoulder with the dancer on the Right - finish Facing Up in a Line with that New Middle in the Middle. When you invert the line both end dancers must move immediately to the other end of the line, with the middle person following one of them through the arch. The middle person can help by bringing both hands forward as they raise their right hand, to indicate to the other two dancers that they should move. Notes: Keep aware of the shape of the set and make sure you are in one of the five positions. Notes: It helps if the Bug drifts towards the side they are arching as the back up. Notes: Make sure you turn all the stars all the way, then step through quickly; at the bottom and the top turn quickly to face back so that you are ready for the next move. Half Hey for Three (three of them in parallel columns) - all turn to the Right to face "West". The caller shouts, "Westward", the dancers shout, "Ho!" Don't grip during the "Left Hand High, Right Hand Low" moves as the middle dancer has to follow the end dancer through the arch. Shoot the Owl: The end dancers make an arch and propel the middle dancer through it. Polka Swing: Travel anti-clockwise around the whole set while circling left (i.e. clockwise) in your threes. One person pauses and rotates the other two around them, then the next person pauses, and so on. Basket: Inside Basket is optional: cross your hands and hold hands in a circle. The title is a play on "Reel", another name for a Hey. The ladies move one place AC each time; eight times through gets you home. Formation: Six Couples in Three Lines of Four, in a Triangle. B2 All Six Ladies Chain Five places, the Men Courtesy Turn them once or twice. You have a New Partner, remake the Triangle. In the Ladies' Chain the Ladies all Star Right all the way to their Corner. Pass five men, counting your partner as number one. It is easier for the men to just work out which lady is in front of their current partner - take her out and turn her - she is your new partner. The men don't move from their home position, so it is their responsibility to remake the lines correctly. Formation: Six Couple Square - Two Couples in a Line on each Side. 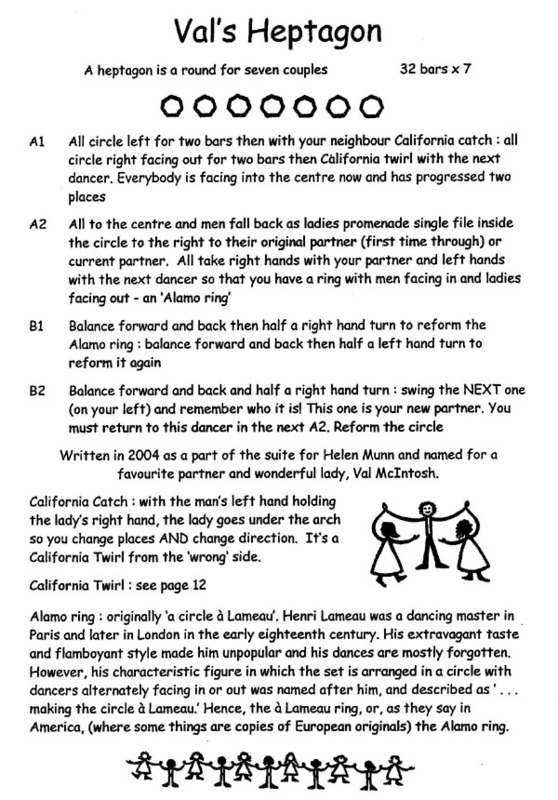 A1 Grand Square: Side Couples give Two Hands to Partner and act as a single unit. Ladies dance in all six places; Men are home after three times through. Start with lots of space above the set! This would normally be a symmetrical ceilidh swing rather than a ballroom-hold swing. Lines Go Forward & Back - during which each pair of Men and each pair of Ladies put their arms around each other's waists to make a single "Man" or "Lady"
The next moves are done as "doubles"
Can also do Doubled R&L Through; Hey for Four Doubles; etc. I'd love to hear from you if you try this dance.